Dr Adamali’s main interests are in the management of patients with interstitial lung disease, its diagnoses and treatment. He is involved in the diagnosis and the management of idiopathic pulmonary fibrosis, hypersensitive pneumonitis, sarcoidosis, connective tissue (scleroderma, rheumatoid disease, sjogren disease) related interstitial lung disease, smoking related interstitial lung disease, pulmonary vasculitis and occupational and drug induced lung disorders. He has completed his education in Montreal (McGill University) and Dublin (University College Dublin). He subsequently completed his respiratory training in Dublin. He received a European Respiratory Society Fellowship which allowed him to work in the Royal Brompton Hospital, London. At present he is actively working currently at the Bristol Interstitial Lung Disease (BILD) Service at North Bristol NHS Trust. 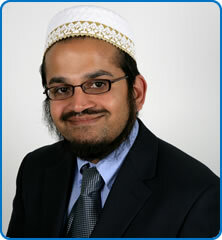 Dr Adamali is currently involved in several interstitial lung disease clinical trials at Southmead Hospital. His research focus is interstitial lung disease, understanding mechanisms of these diseases and working with service provisions of these patients. He is affiliated with British Thoracic Society, American Thoracic Society and European Respiratory Society.